Please click here for further information and event tickets. Posted on April 8, 2019 by Victoria College and filed under Information, Networking. 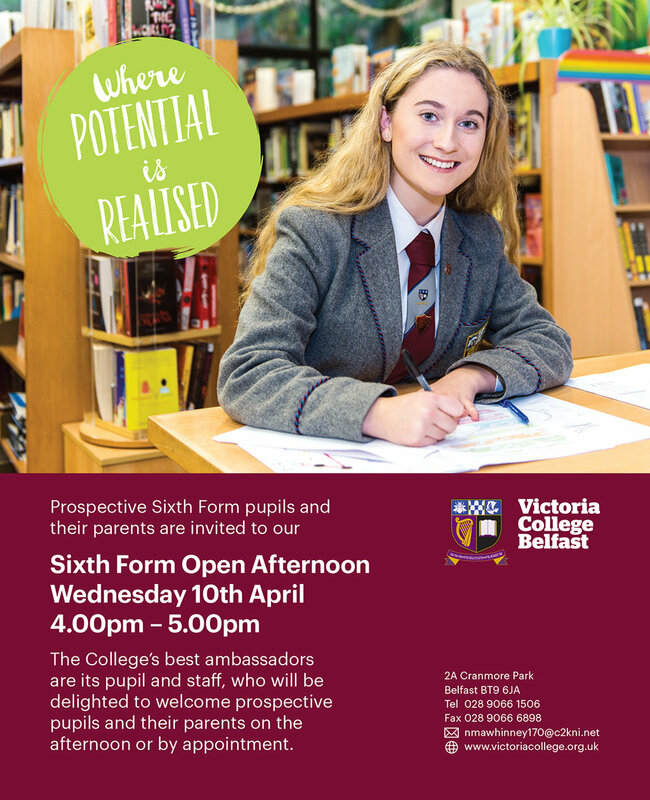 Posted on March 14, 2019 by Heather Dornan Wilson and filed under Information, Announcement and tagged 6th Form Open Day. On Friday 8th March April Hutchinson, Tabitha Jones and Abby Palmer from year 13 represented Victoria College at the Speaker’s event entitled “Better the balance, better the world” in Parliament Buildings, Stormont. The event gave young women from all over the province the opportunity to meet with female MLAs before having the privilege of participating in a lively session in the Assembly Chamber chaired by Assembly Speaker Robin Newton MLA. Posted on March 14, 2019 by Heather Dornan Wilson and filed under Experience, Politics and tagged International Women's Day. Our Intermediate swimming team, Lily McGuire, Sasha Mckeown, Emma Montgomery and Amy Montgomery were crowned Ulster Grammar Schools’ Champions for 2019, after coming out on top from a playing strong field of 76 Grammar schools from across Ulster. Sasha picked up 2 individual golds, Emma one gold and Lily a silver. The team went on to take gold in both the medley and freestyle relays. Posted on March 14, 2019 by Heather Dornan Wilson and filed under Sport, Success and tagged Swimming Ulster Grammar School Champions. Posted on March 14, 2019 by Victoria College and filed under Announcement. On Thursday 7th February 2019 six students from year 13 in Victoria College participated in the Mock Council of the EU in Belfast City Hall. Veena Sivakumar, Tabitha Jones and Anabel McClements represented Ireland and Katie Thorogood, Ellie Cross and Raz Hassan represented Slovenia, with each country participating in lively debates on the controversial themes of migration and climate change. Posted on February 12, 2019 by Heather Dornan Wilson and filed under European Connections, Experience and tagged EU Mock Council politics. The VCB 1st XI beat Royal & Prior school away in Raphoe on Saturday 9 February by 3 goals to 1. Our team is now through to semi final of the Ulster Hockey Senior Shield. Posted on February 12, 2019 by Heather Dornan Wilson and filed under Sport, Success and tagged Ulster Hockey Senior Shield.